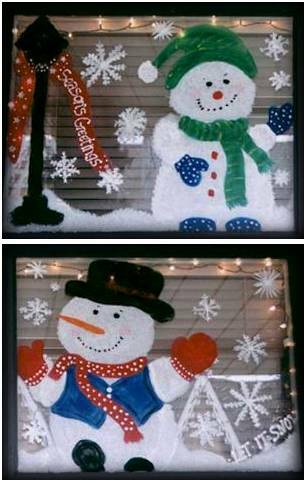 Learn how to make your own easy homemade winter or Christmas window displays. I love painting my windows for the holidays and you can too. The paints are easily removed and you don’t have to be an artist to do this. I am not! Each year I paint my front windows for both Halloween and Christmas. This is my window from a few years ago. The neighbourhood children always linger when I’m painting and wait patiently with excitement to see what I’ll paint each year. I usually use pictures from Greeting cards or window clings as a guide and the more I paint, the better I get at it. Children’s Christmas coloring books are also a good source of inspiration for your decorative windows. You can paint something as simple as just snowflakes or add snowmen, etc. I can’t give a pattern for this, but a print out of the photo should help to guide you along. I’ve used all sorts of paints over the years and have found tempera to be not only the best, but the least expensive. The downfall to water paints is that if rain or water touches the windows, the paint will wash off. I paint my windows on the outside panes, but they are protected by an overhang. I prefer painting on the outside, as this makes the clean up easier. You certainly, can paint on the inside, but you’ll need to take extra care when cleaning up. To paint your windows, wash thoroughly with a window cleaner and dry. Paint your design either inside or out. The clean up should be done on the warmest winter day possible. A bucket of warm water and a large rag will wash away the paint easily. If you have painted the inside panes, be careful not to drip paint on your frames or floor. Though it is claimed that these paints are washable, some of the dyes will stain.